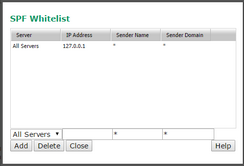 To get to this page, to to Services → SMTP Server → Spam Reduction and press the SPF Whitelist button. SPF (Sender Policy Framework) is a way of publishing in your domain's DNS records which IP addresses are allowed to send mail from your domain. This can be used to help the recipient know that the message really came from the sender it claims to have been sent from. Unfortunately, it is not uncommon for domain owners to publish incorrect SPF records due to not understanding them fully and not obtaining competent help. Because of this, you may need to set up 'whitelist' entries so that VPOP3 will skip SPF checks from certain sending domains or servers. The SPF Whitelist screen lets you configure these whitelist entries. To add an entry, enter the details in the four boxes above the Add/Delete/Close buttons, and press the Add button. To delete an entry, select it, and press the Delete button. To edit an entry, double-click on the cell in the table, and edit it. Changes take effect immediately. •Server - this can be All Servers or This Server. If you have multiple SMTP services (in VPOP3 Enterprise) then this will indicate whether this SPF whitelist entry just applies to this particular service or to all of the VPOP3 SMTP services. •IP Address - this indicates the sender's IP address or can be blank to indicate any sender IP address. You can use CIDR syntax in this field (eg 192.168.10.0/24). •Sender Name - this indicates the part of the email address before the @ symbol. You can leave this blank or use * to indicate any sender name. * and ? wildcards can be used in any case. •Sender Domain - this indicates the part of the email address after the @ symbol. You can leave this blank or use * to indicate any sender domain. * and ? wildcards can be used in any case.